Putting a price on art may not be an exact science, as the value of an artwork may be of a subjective nature, but there is a method on when to give art a high or a low value in the art appraisal report. Two fine art appraisal experts were asked for their professional advice. Fine art appraiser Mark Grove advises: "Would-be appraisers need to be aware that anytime that there is a tax consequence for the intended use of an appraisal report the IRS requires that the appraiser be an accredited member of a major appraisal society (AAA, ISA, ASA)." Providing a longer answer is fine art appraiser Mary Carpenter. She advises: "How to appraise an art object is a fairly open-ended question. 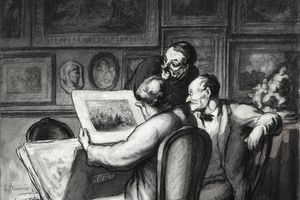 But the main rule I follow is to examine the work with my own eyes, or in rare cases, rely on the opinion of an expert on that subject, such as a museum curator or a scholar. I personally am not a big fan of online appraisals. I only appraise those works which fall into my field of expertise. One learns very early on that it is much better to say "I don’t have the expertise, but I can refer you to someone who does," rather than to try to know every kind of art. No one can know everything." "As an art appraiser, I examine the work, take measurements, notes about condition, signature, any other physical traits, and then photograph the object. Looking at the back of two-dimensional works is as important as looking at the front since there are often gallery stickers or identifying features which are extremely useful." "Any documentation about provenance, its purchase or any other relevant facts provided by the owner about the object are also extremely useful." "How I craft an individual appraisal report depends on its purpose. There is more documentation needed for any reports which are possibly to be reviewed by the IRS." "The values for Fair Market Value would tend to be lower than for an Insurance Replacement Value. But there are no hard and fast rules as to when to go high or low. It depends on the market of the individual artist and the purpose of the appraisal." "The purpose is the primary consideration as to what approach to take. And even then, a certified appraiser can only reflect the market and not go artificially higher or lower to accommodate a certain end the client might request."